An air-powered jackhammer is not the only way to break thick rock or concrete. Kennards Hire says many contactors and home improvers are breaking with tradition and choosing hydraulic power. It is a trend that has already manifested itself in the US and Europe, says the company, which has more than 90 locations across Australia. A hydraulic power pack with a 25kg hammer provides as much power as a 90lb (40kg) air breaker. What is more, it is lighter and easier to use, resulting in less fatigue for the operator. Instead of towing a heavy air compressor, the 65kg power pack can be transported in a ute or van, and moved around easily on site. Builder Steve Howells hired a hydraulic power pack from Kennards Rozelle to break up a tile-covered, 125mm (5 inch) thick concrete slab. “We were renovating an old house in the inner-city, and would have had trouble parking a compressor,” he said. “It also would have been noisier for neighbours. 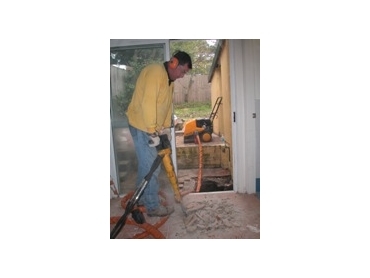 Kennards also hires air-powered jackhammers as well as a range of electric hammers.